This exhibit includes 3 pieces of work completed over a two-year period. All of the pieces show my connection to the land and the water that shapes our lives. Ethel Hills - "Hills Farm #5" - Watercolor - 22" x 30"
“Hills Farm #5” is part of a series of paintings depicting the farm land where I grew up in Hollis, NH. Not only are there fields, orchards and barns, but also the fresh water marsh, brooks, and the water hole where we played as children. The water that runs through this land is probably more important to its value as farmland than the land itself. 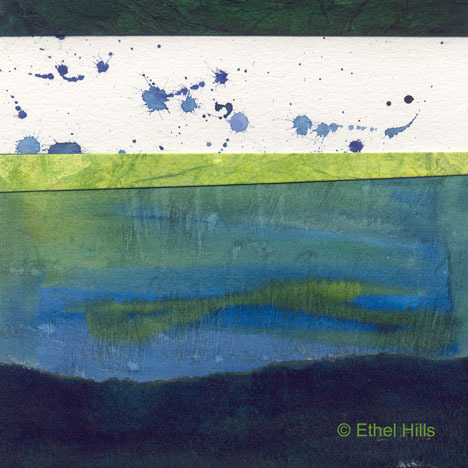 Ethel Hills - "At Pond's Edge" - Mixed Media Collage - 6 1/2" x 6 1/2"
“At Pond’s Edge” makes me think very much of the waterhole on a summer day. It was just a hole dug in the brook to make a pool for fire protection, but it felt like a playground of sorts to us complete with frogs, tadpoles, fish, crawdads and turtles. 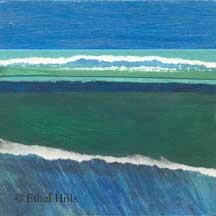 “Color Block # 7 – 4 inch panel” is a reminder of my current home near the ocean in Hampton. 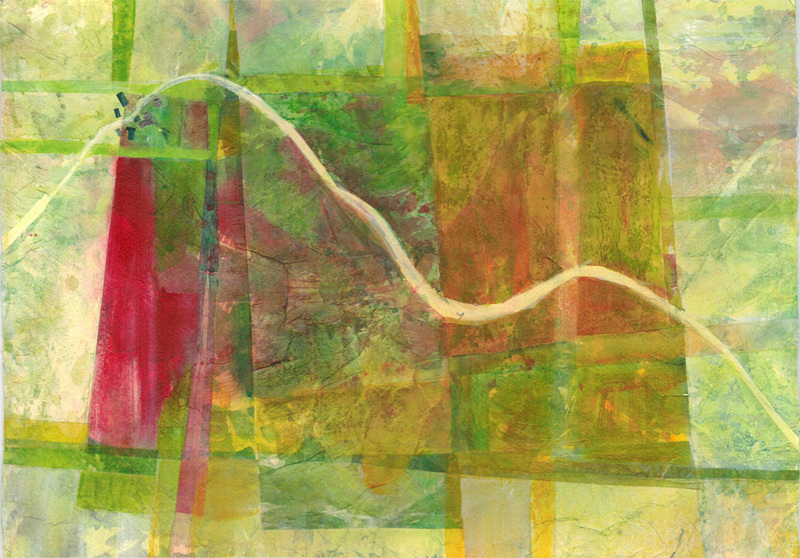 Ethel Hills - "Evensong" - Mixed Media Collage - approx. 7" x 7"
I am fortunate enough to have been accepted into two juried exhibitions. The first is the 25th Annual Omer T. Lassonde Juried Exhibition open through April 29th at the Robert Lincoln Levy Gallery of the New Hampshire Art Association, 136 State Street, Portsmouth, NH. This is the biggest year ever for this exhibit. They received almost 200 admissions. I’m very excited that one of my paintings, “Evensong”, was accepted into this show. 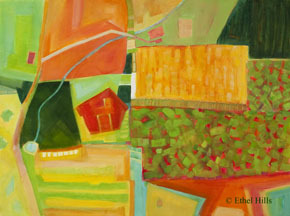 One of my “Hollis Land Project” paintings was accepted into “Dig It: Locally Grown Art”. This exhibit is sponsored by WCA-NH (Women’s Caucus for Art, New Hampshire Chapter) and The Framers Market Gallery in Manchester. The theme for this exhibit is organic and locally grown food. I think this will be a fabulous show. The reception is this coming Thursday, April 14th from 5 to 8pm. This is part of Open Doors Trolley Night in Manchester, which is a wonderful opportunity to check out lots of arts venues. Start anywhere on the route, then travel to other venues via trolley. Here’s a sneak peek of the exhibit. 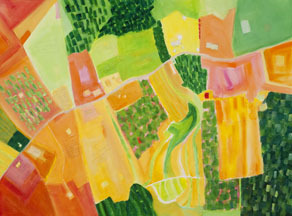 My painting “Woodmont East #4” depicts one small part of the extensive Woodmont Orchards in Hollis, NH. 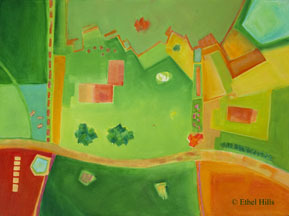 Ethel Hills - "Woodmont East #4" - Acrylic on Panel - 8" x 8"